Scammers will be trying to bilk Cubs fans out of their money by selling fake tickets and unofficial merchandise during the postseason, according to the Better Business Bureau. CHICAGO — Cubs fans are excited to see their team in the postseason — but scammers are also excited to make money off them, according to the Better Business Bureau. The Cubs will face the winner of Wednesday's National League Wild Card game on Friday and Saturday at Wrigley Field. Tickets to those division series games are expected to be the most expensive in the history of baseball, according to Ticket IQ, with potential Game 5 tickets reselling for nearly $1,000. 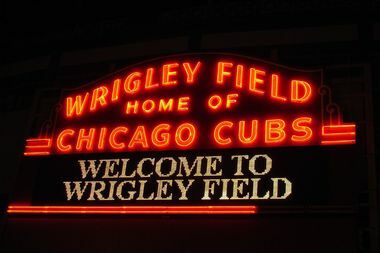 That means scammers will be trying to bilk Cubs fans out of their money by selling fake tickets and unofficial merchandise, according to the Better Business Bureau. • If a one-time deal seems too good to be true, it probably is. • Buy tickets from reputable sellers. The Cubs' website has information about how to get postseason tickets. • Check out your purchase to see if it has an "official hologram and license from the sports league," since those are hard to fake, according to the Better Business Bureau. • Use a credit card so you can dispute the charge if necessary. • Look for reviews about the seller you're considering buying from. • Report scammers. You can contact the police and the Better Business Bureau's "Scam Tracker."